Alvin the Deep Sea Submersible is Half a Century Old! Fifty years ago, the deep sea vehicle Alvin made its first free dive, submerging to 35 feet below the waves. Since then, DSV Alvin has been repeatedly overhauled and upgraded, keeping pace with current technology in countless dives and endless missions carrying humans into the deep blue sea. Top image: Even octopus love Alvin. Or is that murderous rage? 2008. Forging the original Alvin sphere in 1964. In 1962, the Woods Hole Oceanographic Institute (WHOI) contracted with General Mills, makers of Cheerios, to build a research submarine. For $498,500, General Mills built a submersible capable of diving to 1,829 feet while keeping its humans alive. Soon, the submersible earned its name: Alvin, in honour of Allyn Vine, a WHOI scientist who got the idea started at a conference in 1956. Alvin was officially commissioned on June 5th, 1964, and made a test dive in the Woods Hole Harbor weeks later on June 26th. The following year, Alvin and the improvised catamaran Lulu continued testing, ranging the Bahamas, inspecting a listening array in the Tongue of the Ocean, and diving deeper and deeper in longer and longer dives to obtain Navy certification. Ever since then, it's been on one series of adventures after another. The seven-meter long submersible carries a titanium sphere cockpit 2.1 meters in diameter where the pilot and two scientists can peer out at the watery world around them. Although Alvin carries enough air to keep everyone alive for up to 3 days, limitations like the cold environment and lack of toilet limit each dive to about five hours. While uncrewed robotic explorers can stay underwater longer, Alvin provides its crew with a first-hand view of how ocean systems interact. 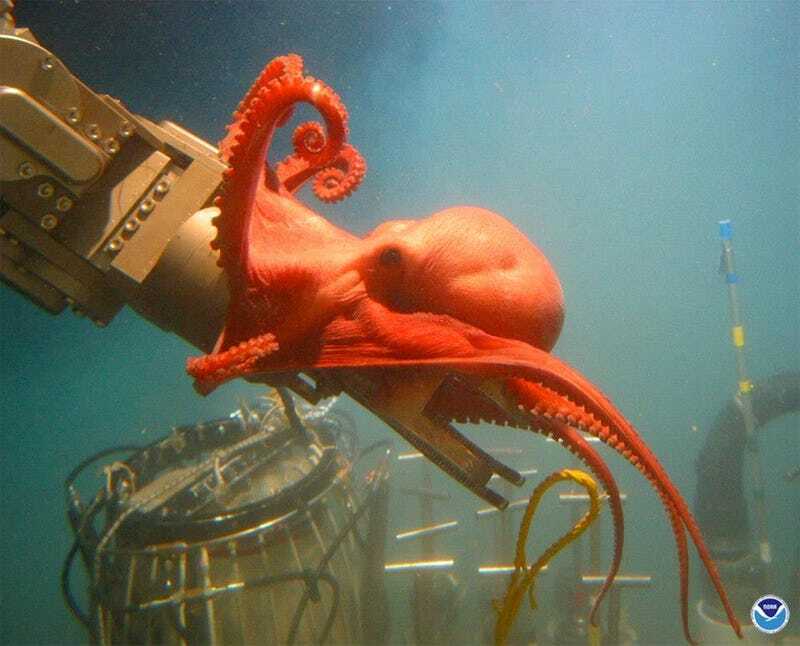 The submersible can also collect and return samples of animals, rocks, sediment or fluids from the seafloor, hauling them to the surface for further investigation. Alvin: research submersible; bomb recoverer. 1966. In 1966, Alvin teamed up with CURV to search for and recover an hydrogen bomb dropped during a ship collision near Spain. The next year, the submersible got in a fight with a swordfish, dragging the fish to the surface where it was cooked and eaten for dinner. Months later, it lost a battle with itself and lost an arm during a rough recovery which was later recovered and reattached. That hydrogen bomb was around here somewhere... Alvin searching for a misplaced bomb in 1966. 1968 was a bad year, when the submarine fell off its support cradle and sank. While the pilot escaped, Alvin remained at 5,000 feet for ten months until an effective recovery mission could be executed. The accident proved to be an unexpected science experiment, as the submersible's minimal structural damage, cold deep-ocean temperatures, and lack of decaying oxygen unexpectedly preserved abandoned lunches for the better part of a year. It took until 1971 to fully restore the vehicle. The installation of a new pressure hull and ballast system in 1973 earned Alvin an upgraded certification, freeing it to dive twice as deep to 12,000 feet. The following year, Alvin teamed up with a pair of French submersibles Cyana and Archimede to take the first-ever up-close peek at the Mid-Atlantic Ridge. In 1976, Alvin was certified for even deeper dives, permitted to explore up to 13,124 feet below the waves. Tubeworms at a deep sea vent look like entirely alien creatures. 1979. From there, the adventure just kept on going, with upgrades, discoveries, and close encounters deeper and deeper in the ocean. In '77, Alvin slithered through the Panama Canal and puttered about the Galapagos Rift. Everyone is downright startled to discover whole communities of deep-sea organisms clustered around vents. It's too dark for the creatures to live off sunlight and photosynthesis, so instead they perform chemosynthesis. This sets off an obsession: In '79, it repeated the journey, and discovered yet another environment of vent communities clustered around black smoker" hydrothermal vents. The vents live up to their names: black, hot, chemical-rich water gushes from towering vent chimneys. Life clusters nearby, processing the chemicals to sustain their activities. The Titanic and Alvin have a personal encounter in 1986. By 1980, Alvin celebrated its 1,000th dive by ducking around Galapagos once again. Most of the '80s were spent investigating vent communities from Washington to California and along the Panama Rise, exploring this new vista into how and where life can survive. After, it wandered past Hawaii to poke at its newest not-yet-an-island volcano. Possibly most notably within a cultural context, in 1986 the not-so-little submersible carried Dudley Foster and Bob Ballard to explore the Titanic. Foster and Ballard can go a few hours without a toilet if it means they get to explore the Titanic. 1986. In 1991, Alvin helpfully searched for and retrieved the lost remote operated vehicle tow system CURV III, then headed north to participate in multidisciplinary investigations of the Juan de Fuca ridge offshore of the Pacific Northwest. In 1994, the submersible took on salvage operations once again, this time to collect a lost university rock drill. By its 30th birthday in 1994, Alvin posed a philosophical challenge: is it still the same machine when every component and part has been replaced at some point for repair or upgrade? Alvin may spend its shore-leave starring in B-grade scifi movies. 1994. Tight budgets hampered dives throughout the '90s, with repeated research seasons curtailed to conserve funds. Even so, in 1995 the submersible hit another milestone with its 3,000th dive. Alvin got even more upgrades, adding on laser rangers, manipulator arms, and assorted bits and pieces to certify it for ever-deeper dives. Between the shutdowns, scientists were able to investigate a whale carcass, revisited the carcass years later when it was a skeleton, had a date with the French submersible Nautile filmed by the BBC, kept up several long-term research projects, and tested out all its shiny new gear. Alvin looking lovely in its home environment. 1987. Alvin kicked off 2000 by discovering yet another previously-unknown ocean environment, this time the "Lost City" along the mid-ocean ridge in the Atlantic. Another year, another new ecosystem. 2000. Mantle rocks react with seawater to build unusual geological structures, and as seems to happen in every location with chemical-rich waters, another unique chemosynthetic community. In 2002, Alvin headed back to the Galapagos to check in on vent systems visited years before, only to find them buried by fresh lava flows, and whole new communities thriving in the altered environment. A few years later in 2004, Alvin celebrated both a 40th birthday and a 4,000th dive. The critters on the seafloor of the Gulf of Mexico create a dark, watery garden in the wake of the Deep Water Horizon spill. 2010. Two years later, Alvin went on an extremophile binge, carrying researchers to observe life in extreme sulfide concentrations, carting a different group of researchers down to marvel at critters who call methane seeps home, and bouncing around the teeming communities of hydrothermal vents. Another two years later, the submersible delivered geodetic stations to perform long-term monitoring along the East Pacific Rise. Undergoing a major overhaul to reach deeper depths. 2011/2012. In 2011 and 2012, Alvin left the water for some serious rebuilding and overhauling, this time to a design depth of 4,500 meters. By November of 2013, it had been tested and certified down to 3,729 meters depth, but they couldn't find a deeper spot nearby to keep on diving! For most of this year, the submersible has been tooling around the Gulf of Mexico before heading out to Florida in June. Alvin with a swimmer somewhere near Florida. 2014. All images credit WHOI; go here for these photographs and more in wallpaper-appropriate resolutions. For a complete, detailed history of five decades of exploration with Alvin, check out this timeline.